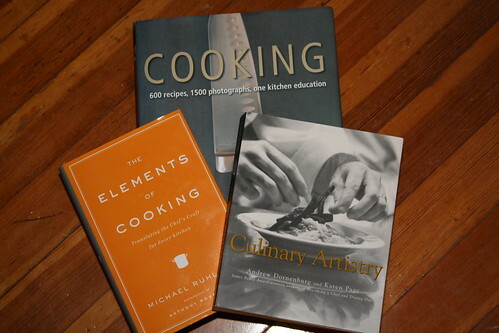 My books from the Good Cook book club arrived! Well 3 out of 4 anyway. The one I wanted the most was back ordered, of course, and now I get a letter saying that it's no longer available. It was Marinades, Rubs, Brines, Cures, & Glazes. I still want it and will probably just go out and buy it. Anyway, here we have Cooking by James Peterson, The Elements of Cooking by Michael Ruhlman and Culinary Artistry by Andrew Dornenburg and Karen Page. I've had Culinary Atristry for about a year and I love it because it lists every food you can think of and then tells you what it pairs up with. Love it! Cooking is a huge book full of cooking techniques and recipes. The Elements of Cooking reads like a novel but breaks down all sorts of cooking techniques. The first one I put into practice - Scrambled Eggs. That's right, I've been making scrambled eggs forever and ever and I never realized that I was cooking them too hot and they had no flavor. So I turned down the heat, cooked them slow and took them out of the pan sooner than normal and viola! perfectly delicious eggs. I also read Michael's blog. I love him. Another book I got from the book club is What's a Cook To Do by James Peterson. It's another technique book. I have 3 and a half more working days until vacation and I am just about going crazy waiting for it. I hope I get out early on Thursday! Those sound great Jenny. I was just talking with my mother how I'd love to take a cooking class to learn the basics; it sounds like these books might do the trick!